Scientists are looking into a horrendous disease that is causing starfish to rip off their arms and gut themselves, in what is probably the most disturbing image you'll read today. The rapidly-spreading disease is found in areas with high starfish concentrations on the West Coast, and is a new phenomenon for researchers, who say they've never seen it before. Dubbed "Sea Star Wasting Syndrome," the dangerous infection causes white lesions to erupt along the arms of starfish, before consuming the whole body, causing the creatures to mutilate themselves and die. The mysterious disease and mass starfish die-offs were first noticed by scientists in June 2013, who have watched the illness spread toward other starfish-heavy areas, from Alaska, to Puget Sound, off the coast of Washington, and down to southern California. Scientists are now utilizing the power of social media to identify the poor creatures and find out more about the relatively unknown disease. 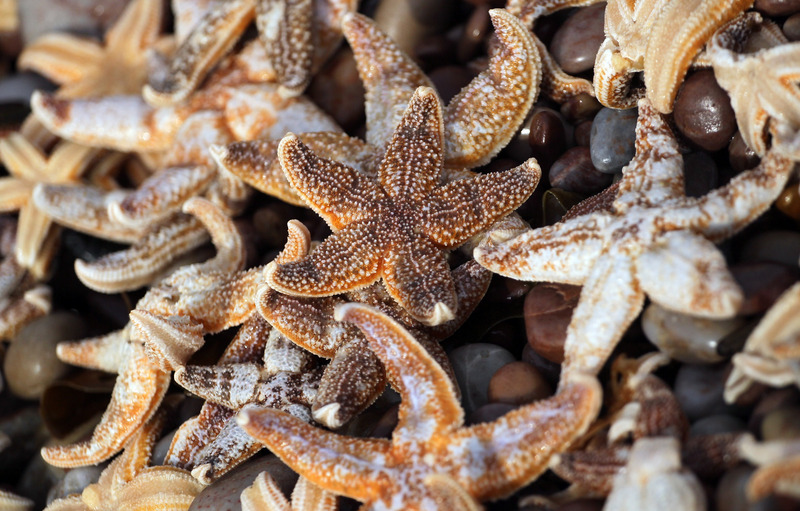 Beach-dwellers should tweet photos of ill starfish with the hashtag #sickstarfish for scientists to study. The disease has also halted the power of starfish to regenerate lost limbs. Usually a key defense mechanism, the sickness prevents them from growing new arms, which they twisted into knots before dying within 24 hours. While scientists don't predict that the disease will lead to the end of starfish as we know them, it's still a worrying time for the sea creatures. Of course, this may be our fault. A number of theories have cropped up over the cause of the starfish deaths, including low oxygen levels in the water and seas polluted with environmental toxins, while warming waters due to climate change also has the power to weaken sea creatures' immune systems, making them ripe for infection. Some scientists have pondered whether the Fukushima nuclear disaster is to blame, with tainted debris and radiation as the primary culprits. Another possible cause is a pathogen that has wormed its way into the starfish population and caused the infection. For now, though, there is no determined cause and the mystery continues. Let's hope these wonderful creatures don't keep hurting themselves because of our mistakes.